Big numbers, and a conspicuous gap at the top of the screen. The next flagship phone from OnePlus looks set to boast impressive benchmark scores, while adopting an iPhone X-like display notch. Images obtained by Android Central from a source close to OnePlus reveal AnTuTu benchmark scores from the OnePlus 6, codenamed A6000, while also revealing other key details about the upcoming flagship. The overall score of 276510 bests the previous champion, Xiaomi’s upcoming Mi Mix 2S, which is set to launch March 27. The CPU score also makes it pretty clear that this phone will run Qualcomm’s latest Snapdragon 845, which shouldn’t really be a surprise given OnePlus’s history of shipping the latest processors. Benchmarks alone can’t tell you much about how responsive a phone will feel to use. However, OnePlus’s most recent devices have been among the most speedy-feeling we’ve used, and it can’t hurt to have that performance pedigree backed up by top scores in synthetic benchmarks. Another well-known company embraces the notch. Most interestingly, today’s leak appears to corroborate earlier live photos of the OnePlus 6, showing a telltale space up top for a display cutout. The middle of the status bar is taller, and conspicuously blank, with the system clock relocating over to the left and a truncated set of icons on the right. There’s pretty much only one reason to arrange your UI in this way, so consider it confirmed that the OnePlus 6 will follow the most polarizing smartphone trend of 2018. The aspect ratio of the screenshots is 19:9 — which is effectively 18:9 with a little extra space up top for the notch. Based on previous leaks we can also expect the phone to pack a glass-backed design — the first in a OnePlus phone since the OnePlus X — along with a rear-mounted fingerprint sensor, dual cameras and minimal screen bezels. Given that we’re seeing details of the OnePlus 6 leak already, it’s possible we’re looking at a launch earlier in the year this time around. Last year’s OnePlus 5 arrived in late June, with the first pre-launch details emerging around a month out from launch. Nothing more frustrating than stuttering video. Make it stop with this. The Netgear R7900 Nighthawk X6 wireless router is down to $129.99 on Amazon. This deal is thanks to a price drop to $150 with a $20 off on-page coupon. It normally sells for around $200 and as high as $220. The drop to $150 was already one of the lowest prices we’ve ever seen on the router, so the extra $20 off is just icing on the cake. 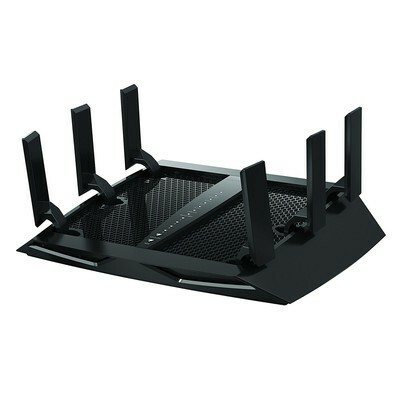 Made for a modern home with streamers and gamers, the Nighthawk X6 has Tri-Band Wi-Fi with combined speeds up to 3.0Gbps. It has the ability to prioritize the devices that are hooked up to it, giving more bandwidth to the ones that need it. The six antennas ensure a powerful signal even at maximum range. It also has a 1GHz dual-core processor and a USB 3.0 port for easy high-speed access. More than 20,000 users give it 4.2 stars. It’s no surprise at this point that the Pixel 2’s camera is the best on the market, but one of its most underrated features is Motion Photos. This records a few frames before and after you press the shutter button when taking a picture, and you can now export them as GIFs. Up until now, you’ve only been able to export files as videos or still photos. However, thanks to the addition of GIF support, you can retain those extra couple seconds captured with Motion Photos and still save and share them as an image file. To do this, open a picture that was captured with Motion Photos, tap on the three dots near the top right, and then select Export. From here, you’ll see a new option for exporting the photo as a GIF. 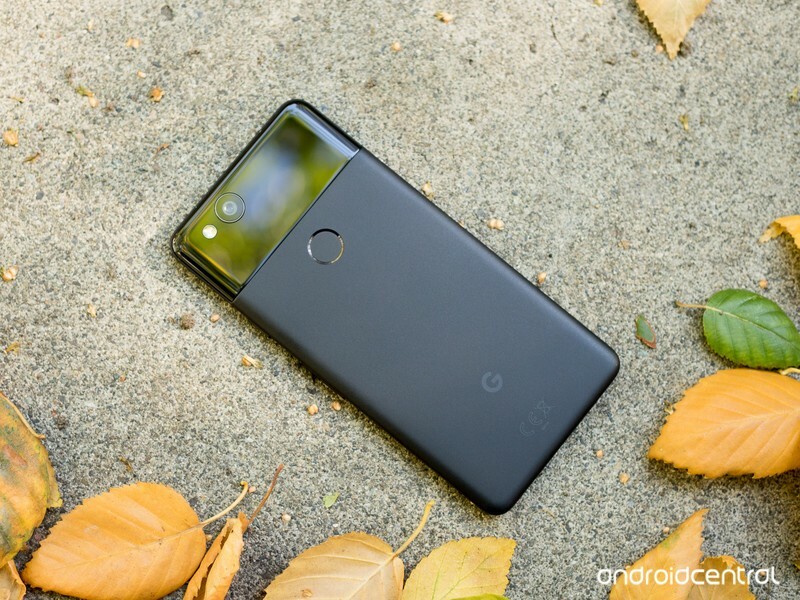 The exporting process takes just a moment to complete, and this functionality appears to be available to all Pixel 2 and Pixel 2 XL users rocking v3.15 of the Google Photos app. On a nationwide level, that translates to 47.3 million smart speaker owners. Over the past 3 years, smart speakers have blown up as one of the biggest markets in the consumer tech space. Amazon, Google, Apple, and others are all racing to get as much market share as possible, and it looks like these efforts are working. Voicebot recently teamed up with PullString and RAIN to see just how many people are actually buying/using smart speakers, and after interviewing 1,057 adults across the United States, it was found that 19.7% of them said they own a smart speaker. Assuming that 19.7% translates to the entire United States, that would mean 47.3 million of the country’s 252 million population own a smart speaker. Of those interviewed, it was also found that 42.2% of smart speaker owners are female and 57.8% are male. Consumers continue to flock toward voice technology in staggering rates, which demonstrates not only the lightning in a bottle that these smart speakers (Echo/Dot and Google Home/Mini) have generated, but ultimately showcase Voice’s impact as a larger behavioral movement. Amazon has 18.4% market share, Google has 18.4%, and the remaining 9.7% goes to Alexa, Google Assistant, and Cortana-powered speakers that are made by other companies. 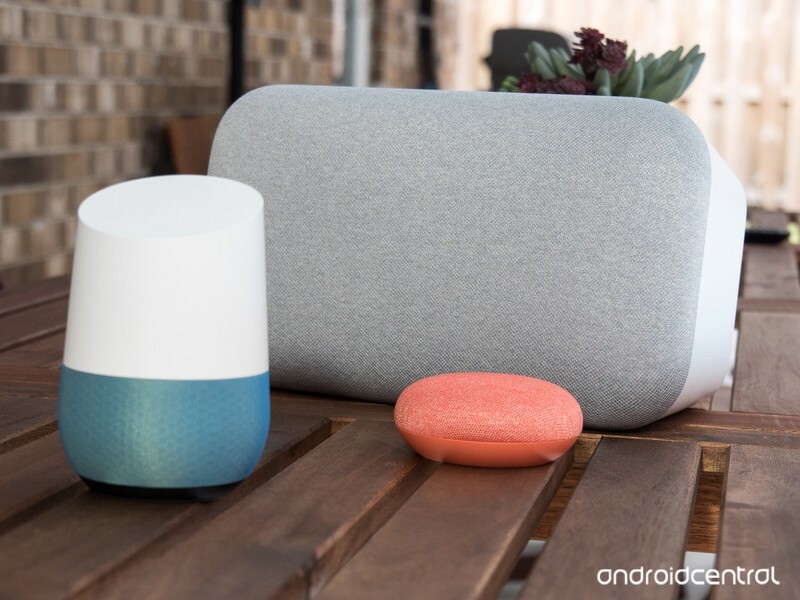 I personally own a Google Home and Home Mini, and I honestly don’t know how I got by without one. I use these gadgets every single day for setting timers, listening to music, making calls, and so much more, and it really is fascinating to see so many people already eager to adopt this new technology. Do you own a smart speaker? If yes, which ons(s) did you choose and why? Sound off in the comments below! Welcome to the world of Virtual Reality! 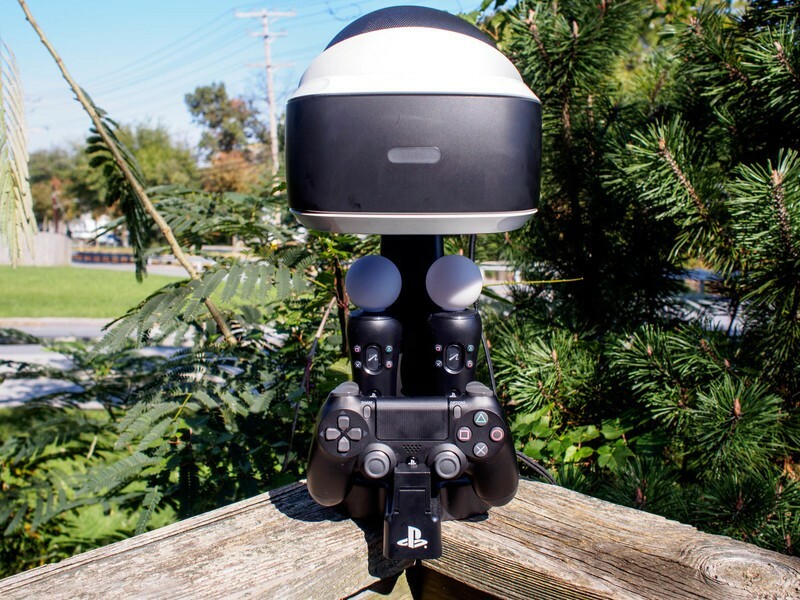 Now that a PlayStation Virtual Reality (VR) has made its way into your life, you wanna find the best display dock to show off your new equipment. So, whether you prefer your command center of gaming to be neat and tidy or are just tired of unpacking and repacking your VR headset, we’ve got some of the best options for you listed below. These days most people are only buying digital copies of their games. It’s less clutter in your house and usually a cheaper price. But, there are always those games you want to have a physical copy of because they’re you’re favorite whether it’s games like Fallout 4 VR or Apex Construct. While this charging dock doesn’t have a spot for your Aim controller or headphones, it does have a spot to hold a small number of your favorite games and your PlayStation itself. It’s not even just holding your console either, the dock itself is a cooling unit! The lights on the stand even light blue when your gear is done charging, and that’s pretty awesome. You can find it on Amazon for $36.96 and the product is 16.3 x 6.7 x 2.8 inches large, weighing about 1.87 pounds. That means this dock isn’t just the best overall, it’s also the cheapest in this line-up, two birds and one stone! 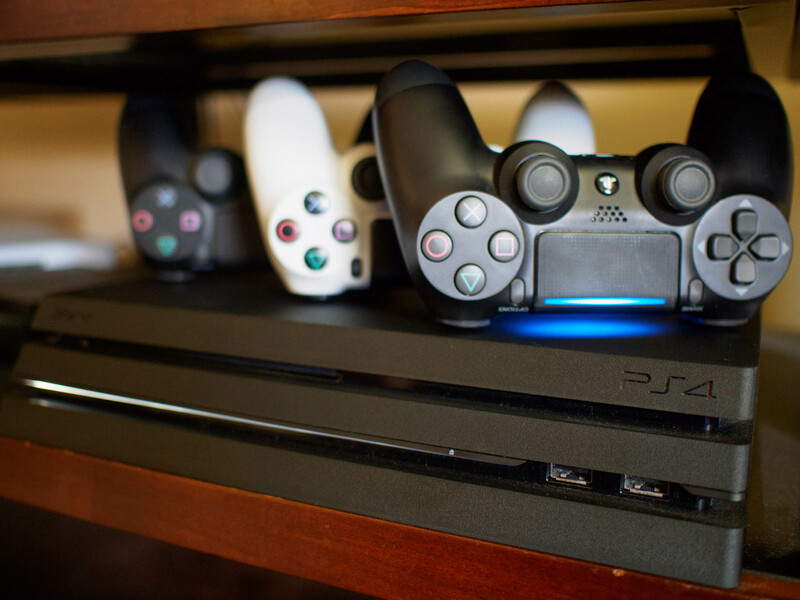 The only downside, in my opinion, is how the headset rests on top of the stand for your PlayStation. This makes the stand a bit large, but it would still look good on some entertainment centers. That makes this charging dock my number one rated! 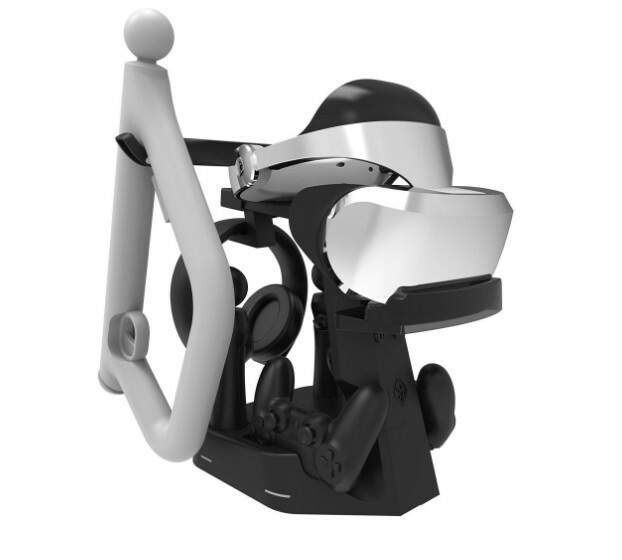 My runner-up dock has to go to Collective Minds’ and their ability to put a piece of equipment together that will hold all of your PSVR gear at the same time. 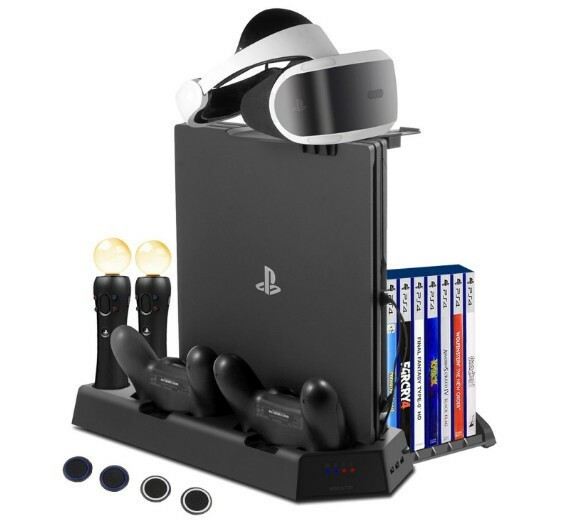 Yes, that means this dock is able to charge two of your Dualshock controllers, two of your Move controllers and even your Aim controller while still having a spot in the back to hang your headphones! While there isn’t a spot for your PlayStation or your headset, this charging stand is still pretty crafty and slick looking. The dock itself is 10.3 x 9 x 4.5 inches large, weighing 14.1 ounces. Keep in mind it will appear larger after you put all of your gear on it because of the Aim controller extension piece. For $44.99 on Amazon, you can pick up this stellar display and charging stand to really piece together your gaming command center… er I mean your living room! When it comes to looks my heart belongs to Asterion Products’ dock stand. The sleek and low appearance of the set-up has everything tight-nit and fitting together like a finely tuned engine. This dock also has red and blue lights to let you know if your gear is still charging, or fully charged. Not just that, as the product is 14 x 6.5 x 10 inches in size, weighing 2.4 pounds. 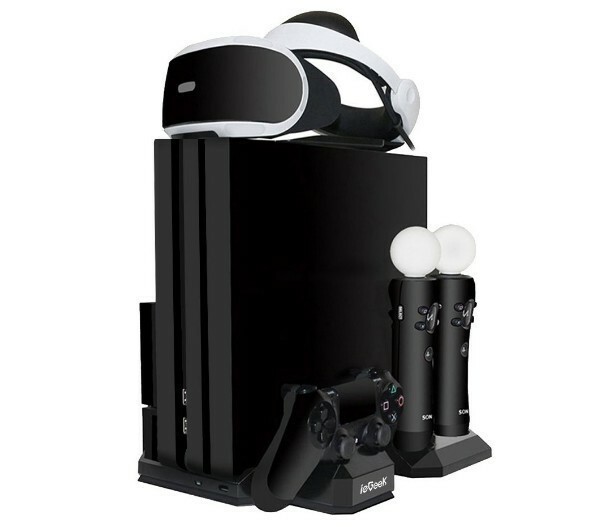 It has a place for your two Dualshock, 2 Move, your headset and your headphones! If you also appreciate the appearance of this stand, you can find it on Amazon for $44.99! Last but not least we have ieGeek’s charging stand that you can get off Amazon for $37.41. Here we have a similar appearance as the FlexDin where the headset rests on top, but in this case, all of your controllers will rest tactfully on the sides of the dock stand. While there are no fancy lights to let you know when everything is done charging there are ports for two of your Dualshock controllers and one of your Move controllers. 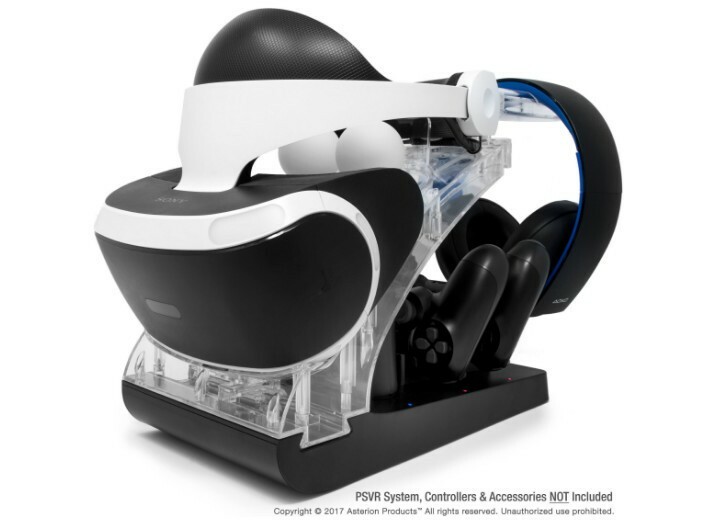 Another cool this about this dock is that there is also a stand to hold the processor box for your PSVR which is a nifty addition I did not see on the other docks! The stand itself is 11.23 x 8.19 x 1.77, weighing 1.43 lbs for a comfortable fit to your entertainment center. What docking stand did you choose to show off your gear? Is your favorite dock stand listed? If not, tell us which one is your favorite and why in the comment section below! 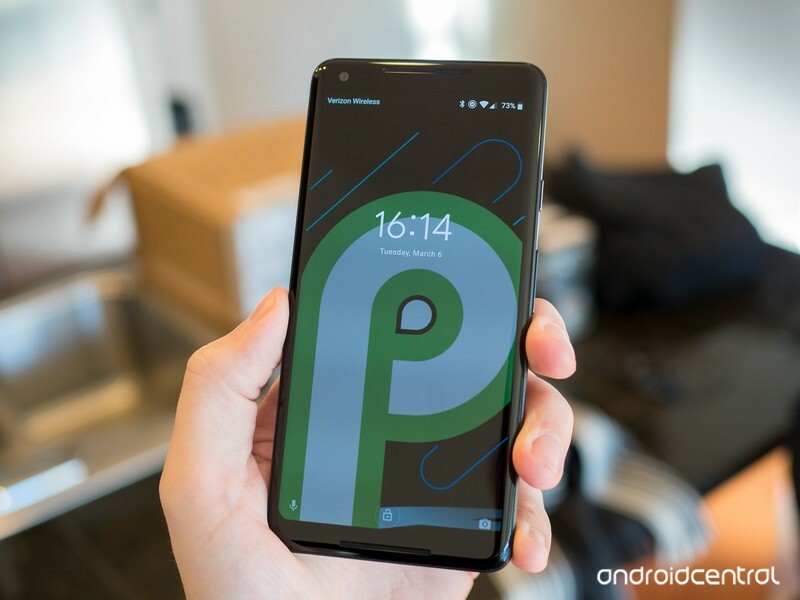 Get the Android P Developer Preview on your phone right away. 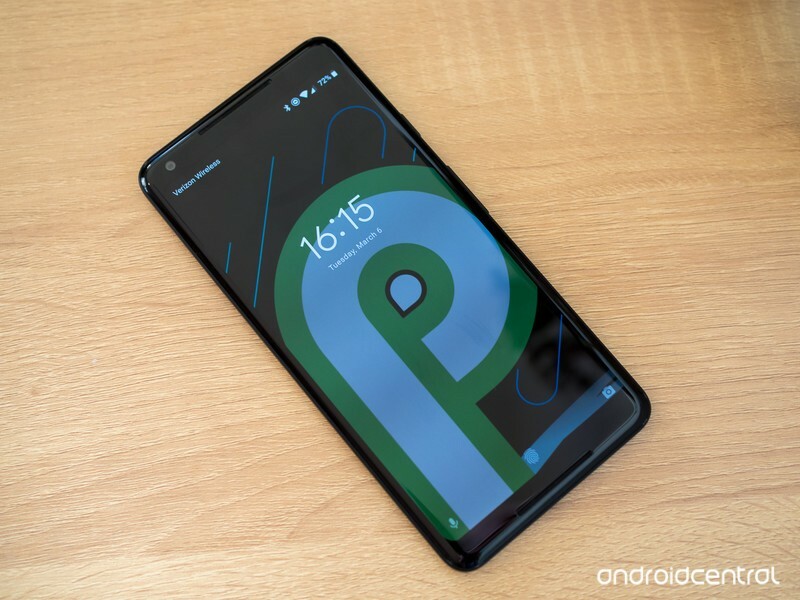 Another Android Developer preview is here, and this time we’ll be getting a look at what Android P has to offer. Eventually, anyway, because the first few versions probably won’t have much in the way of user-facing changes. That’s because the Android Developer preview was designed for developers who need to start working on any changes to their software right away. But even if you’re not a developer, you can get it on your Pixel pretty easily. Getting it on your phone is the same as manually flashing any other Android factory image so that means there’s a little more involved than tapping a button. but don’t worry, it’s not too hard. Here’s what you need to know. Before we go through the steps of sideloading Android updates, it is strongly recommended that you have previous knowledge of working with the Android SDK (software development kit) and the Terminal (OS X or Linux) or Command Prompt (Windows), as it is possible to harm your device if something were to go wrong in the following process. If you need to download the Android SDK you can grab it from the Android Development website and follow their instructions on how to install it correctly. For the following process, all you will need is the adb and fastboot files which are located in the Platform Tools folder, so make sure to read the description at the dev site and grab the right download. Additionally, all the following commands are written as they would be in Terminal on a Linux or OS X platform. If you are following this guide and using a Windows machine, you will not need to use the “./” seen in the guide. Just type the rest of the command line by line in the order they are listed and you’ll be good. Go to your Settings and scroll down to About Phone/Tablet. Go back to the Settings menu and you should find a new option called Developer options. Tap into the Developer options. Plug your device into your computer and tap “OK” on the dialog box asking you to Allow USB debugging while connected to the computer. You can also select to always allow access on that computer. If done correctly, this will be everything you will need to do on your phone or tablet for the moment. Pixel phones bought from Google directly have a bootloader you can unlock. If you want to manually flash software, you’ll need to do this. To do this you must first boot into your bootloader. You can either manually turn off your phone or tablet and hold down the power button and the volume down button to enter your device’s Bootloader Menu or you can enter the following commands into your terminal or command prompt. Run the following command to make sure your device is properly connected to your computer. If it returns a string of characters it means that you are all set to start updating your device. Now to enter into the Bootloader menu just run the following command. At the bottom of the screen, there will be several things listed including the lock state of the device. This should say locked unless you have unlocked your bootloader in the past and never went back and locked it again. To unlock your bootloader, which is required only when flashing a stock firmware image (not sideloading an update), you must enter the following commands. Remember that when unlocking your phone’s bootloader it will factory reset your device, so you will lose everything stored on it. If you have not yet backed up anything important on your device you can hit the power button while Start is highlighted in the Bootloader menu and this will boot you back into your device like normal. Now back to unlocking your bootloader. A dialog will appear on the device asking if you are sure about unlocking. Again this will factory reset your device, so if you want to back out of the process you just need to select no with the power button. If you are ready to unlock your bootloader you press the volume up button and then the power button to confirm that you wish to unlock your bootloader. It is recommended to reboot the bootloader just to give itself a check to make sure everything is working correctly before moving on to the next step. To begin, make sure you are still in the bootloader menu on your device and double check that your bootloader is in fact unlocked. First, make sure that your computer is communicating correctly with your phone or tablet. As long as your device’s serial number comes back as a connected device you are ready to begin updating your device. Now it is time to flash the updated bootloader with the following command. You will not see anything on the screen of your device but there should be a dialog in your terminal or command prompt. When it is done flashing the bootloader you should reboot back into the bootloader to make sure everything is still working correctly. Next, you flash the updated radios. This step is only necessary if you are updating the firmware of a phone or tablet that has cellular radios built into it. Finally, it’s time to flash the actual system image to your phone or tablet. Warning: The following line of code will wipe your device. Normally, you can remove the “-w” from the command but when moving to a beta version of Android it’s not guaranteed to work. When this is done, your phone will restart itself and boot up normally. As this process clears all data from your device, it will take slightly longer for your device to boot up for the first time. Once you have been greeted with the device setup walkthrough process, you know you have successfully flashed a new version of the firmware. If you do not want to enter the commands manually there are scripts included in the compressed folder containing the system image that will do most but not all of the heavy lifting for you. The flash-all script files will automate the flashing of the bootloader, radios (if needed), and the system image. The problem with this process is that you must first make sure that your phone is in the bootloader menu and its bootloader must be unlocked before starting the script. Of course, if these are not already done the script will fail to run and nothing will happen. When you’ve had your fun using the Android P Developer Preview, and you’ve figured out that it’s not stable enough to use as a daily driver, it’s time to go back to Oreo. Thankfully the process is simple, and you just learned how to do it! Simply go back through the same steps above, except for two changes: you don’t need to unlock your bootloader again, and you’ll want to download the Oreo factory image from Google instead. Get back to stock, and maybe you’ll check out a future Developer Preview build. This sounds worse than it is, so don’t worry. But we also understand it can seem like an impossibly difficult thing the first time you’re trying it. That’s OK, we all felt the same way when we first tried it, too. Just take the time to read through everything before you start clicking and tapping things and you’ll do just fine. If you have any trouble along the way, be sure to hop into the forums and ask for help! Messaging notification improvements: Apps can now use the new “MessagingStyle” notification type to include more information in the notification shade pertinent to messaging apps. This includes avatars, conversation information, photo attachments and suggested smart replies. Kratos vs. Fenrir? That would be interesting. 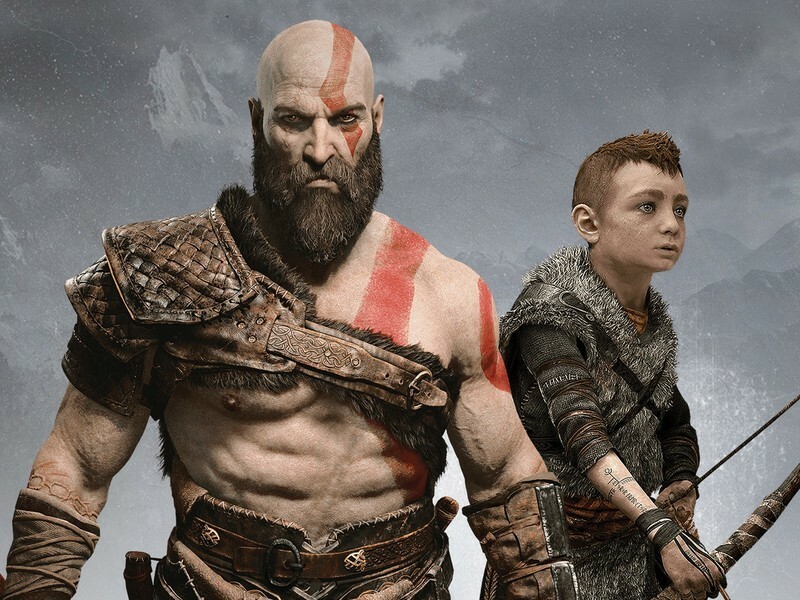 The newest edition to the God of War series releases for the PlayStation 4 on April 20, and pre-orders are available right now. This game is a direct sequel to God of War III, which was first released back in 2010. It’s been a long time since we’ve seen Kratos continue his story, and now he’s releasing his anger on the Norse gods. It will be the first time since the series’ inception that Kratos wasn’t kicking the crap out of Greek deities. Instead of harpies and furies, he’ll be fighting trolls and draugr. That’s not the only change either because Kratos lost his signature chains at the end of God of War III and will now use a Leviathan’s Axe. 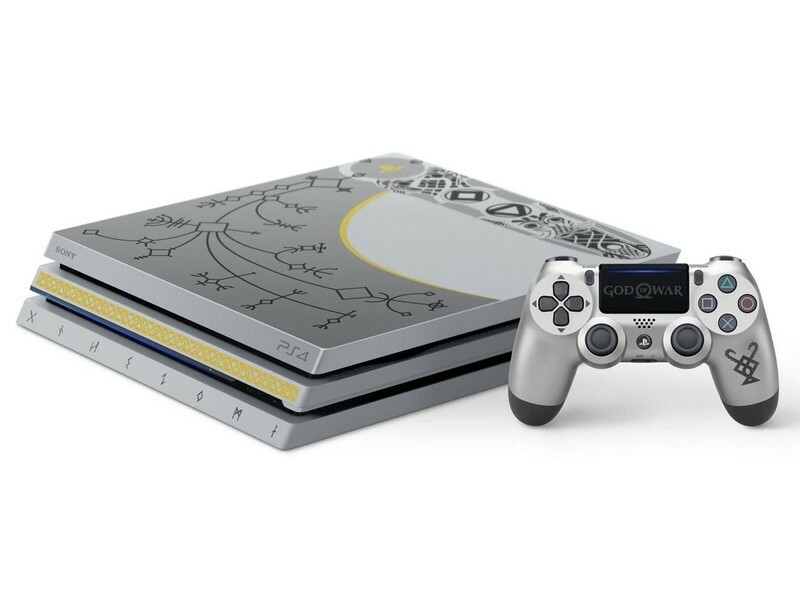 In the spirit of these new changes, Sony will also be releasing a PlayStation 4 Pro with both the console and the controller paying homage to Kratos’ new weapon. This bundle will include the console, a DualShock 4 wireless controller, the new God of War game, and some digital content all for the same price as a regular PS4 Pro at $399.99. You can pre-order the console right now on Amazon, Best Buy, and GameStop. It has been eight years since the last true God of War game. All we’ve seen in that time has been prequels, collections. HD re-releases and stuff like that. While those are great and all, and maybe Ascension wasn’t too bad, what we really need is to know what happened after that fight with Zeus. Some new single player adventures. Some new mythological destruction. If you’ve been looking forward to this game, then you should be pretty hyped about the limited edition console. This is especially true if you already had a PlayStation and you’ve been on the fence about upgrading to the Pro. Considering you’re essentially getting the game for free and getting a design that won’t be widely distributed for very long, the value speaks for itself. Everything about this God of War is going to be very different from previous iterations. For one thing, Kratos has a son now. He has to mentor his son and probably control his temper a little more than usual. The son also plays a part in the platforming parts of the game and possibly the fighting parts (he’s seen with a bow and arrow in the gameplay videos). For another, I’m not sure what Kratos is going to be so angry about. What’d the Norse gods ever do to him? I’m guessing that’ll be made pretty obvious once the game gets going. The gameplay has also changed not just from the chains to the axe, but the viewpoint is also going from a third-person fixed camera to a free over-the-shoulder angle. This will also be the first game to feature Christopher Judge as the voice of Kratos, too. Christopher Judge is most known, by me at least, for playing the character Teal’c in Stargate SG-1. Lots of changes coming for one of PlayStation’s greatest franchises. This is your chance to be part of them. Speakers powered by Amazon Alexa have become a household staple for millions of people across the world. Alexa can be useful in a virtually endless number of ways, but according to some unfortunate users, it’s now scaring the living daylights out of them. Lying in bed about to fall asleep when Alexa on my Amazon Echo Dot lets out a very loud and creepy laugh…there’s a good chance I get murdered tonight. I was trying to turn off some lights and they kept turning back on. After the third request, Alexa stopped responding and instead did an evil laugh. The laugh wasn’t in the Alexa voice. It sounded like a real person. My wife was there when it happened and she is the only person who can drop-in. I still get chills. I don’t personally have an Alexa speaker to test this for myself, and quite frankly, I’m glad I don’t. My Google Home has yet to start cackling in the middle of the night, but should that day ever come, I’ll be throwing it out and swearing off technology until the robot overlords come for us all. 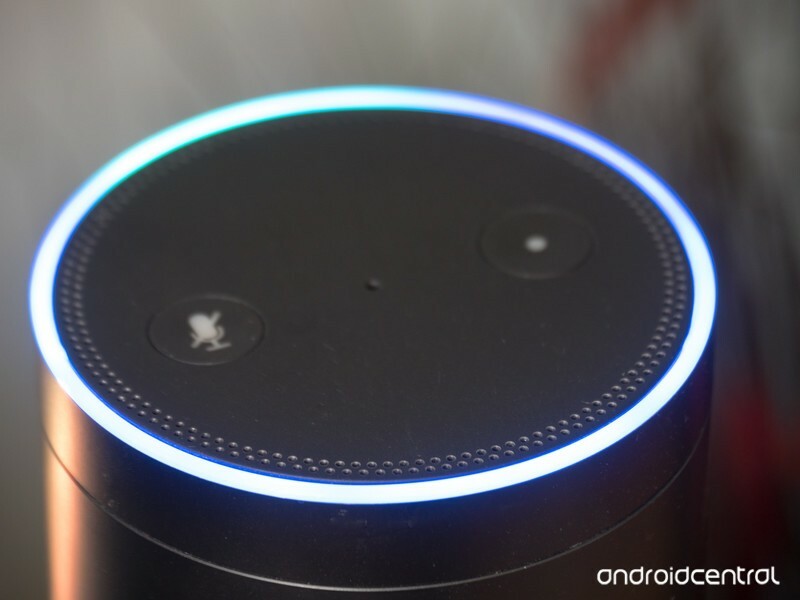 If you’ve got an Alexa-powered speaker, have you run into this phenomenon at all? If you have a Google Pixel 2 or Pixel 2 XL, a fun new feature just went live on your phone. According to 9to5Google, you can now export your Motion Photos as GIFs. Motion Photos do exactly what the name suggests: They capture frames before and after your image, so your picture appears to be moving. Previously, users had two options: “Save as still photo” or “Save as video.” But now, if you open the “Export” menu, “Export as GIF” is a third option. The resulting file size isn’t exactly optimized for the internet: 9to5Google reports that their attempt netted them a 28 MB GIF. But they did note that the quality was quite good, with a resolution of 768 x 1024. Presumably you could use one of the many ubiquitous internet app to trim the file size and optimize it for sharing.